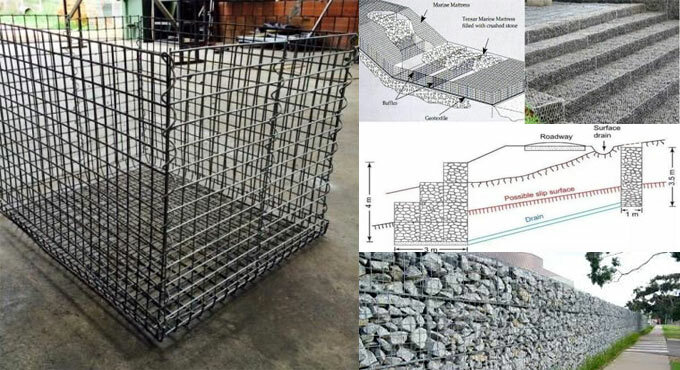 Gabion belongs to a multi-celled, welded wire or rectangular wire mesh container or box stuffed with different types of materials like stone, concrete, rock, sand, or soil. It is primarily utilized for developing erosion control structures and stabilizing steep slope. Various types of gabions are found in several engineering constructions. Often, live rooting branches are provided among the rock-filled baskets to enhance the strength and longevity of the gabion. Uses of gabions: Gabions are mostly found in various engineering projects and can be used to fulfill different purposes. Given below, some common applications of gabions. 1. Various retaining structures like retaining walls, revetment and toe walls to embankments and cuttings. 2. Corrosion prevention structures like sea walls, river bank defenses, canal banks, dams, weirs, groynes and for the safeguard of reservoirs and lakesides. 3. Cylindrical metal gabion is suitable for dams or in foundation construction. 4. It is also utilized as a noise barrier. 5. Gabions can be applied as a temporary flood walls. 7. Stepped gabions can enhance the energy dispersal in channels. 1. Stability: Gabion contains a very high resistance capacity against atmospheric corrosion owning to the perfectly bonded zinc coating on the wire and their capability to support vegetation development. 2. Flexibility: It allows the gabion to be set and bended devoid of any failure and loss of efficiency. Particularly, in the case of unsteady ground and moving water. 3. Penetrability: It can arrange automatic and easy drainage and there is no need to set up the drainage pipes. 4. Strength: Gabions have good strength to combat with flood force, torrential force as well as ice and earth pressure. 5. Cost-effective: It is more cost-effective with regard to both material and labor as compared to other gabion alternatives. 6. Eco-friendly: Recycled materials can be easily arranged into the gabion cage. The spacing in the soil among filling materials facilitate the plantation to develop in due course of time. Gabion components are not impacted with natural phenomena.